Cure closet chaos with one of these DIY-friendly systems. 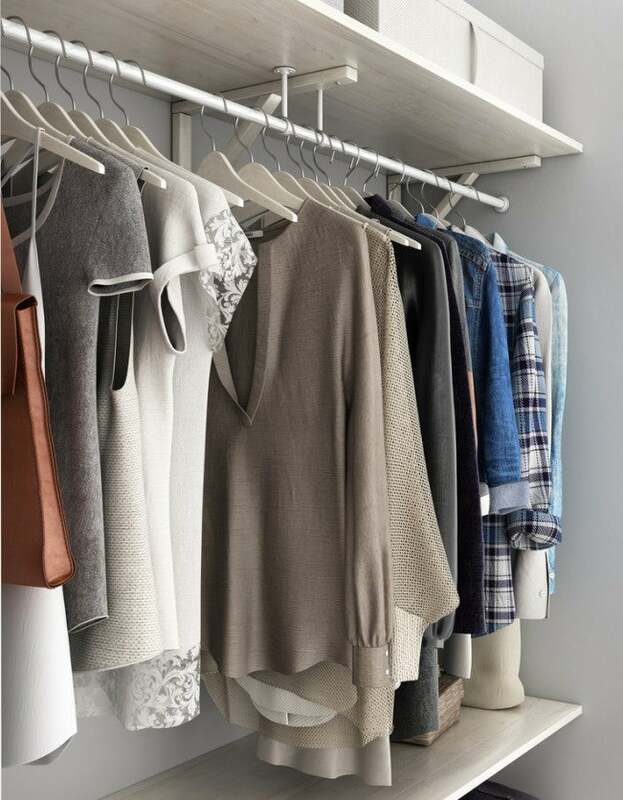 Whether your closet is cramped but navigable or in such disarray that you waste precious time rummaging through it just to find an outfit, a closet system can help you clear the clutter and organize your existing space no matter what its size. 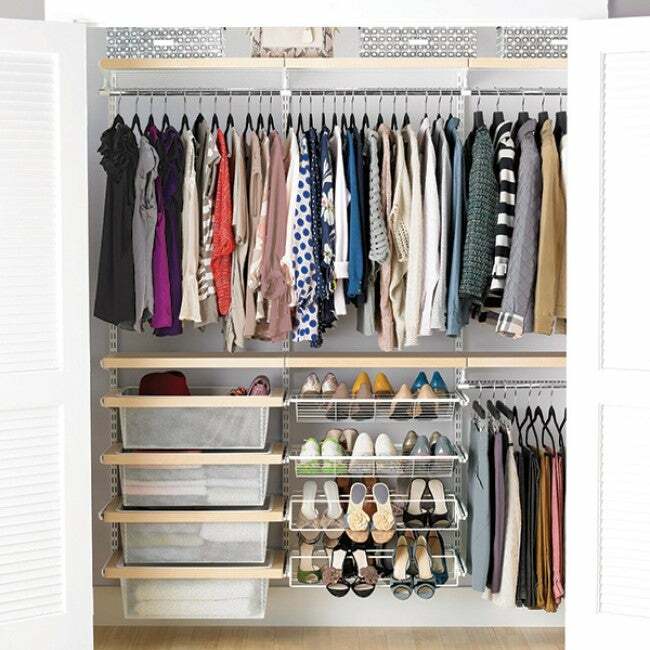 The most DIY-friendly modern closet systems are sold at home improvement stores as kits with all the components you need—hanging rods, storage units, and mounting hardware—to assemble them directly in your closet, and often in a variety of configurations. But not all closet kits are equal, so you want to avoid installing a system that doesn’t suit your space, your stuff, or your budget. Read on to learn what features to look for and get our recommendations for three of the best closet systems before you start shopping. 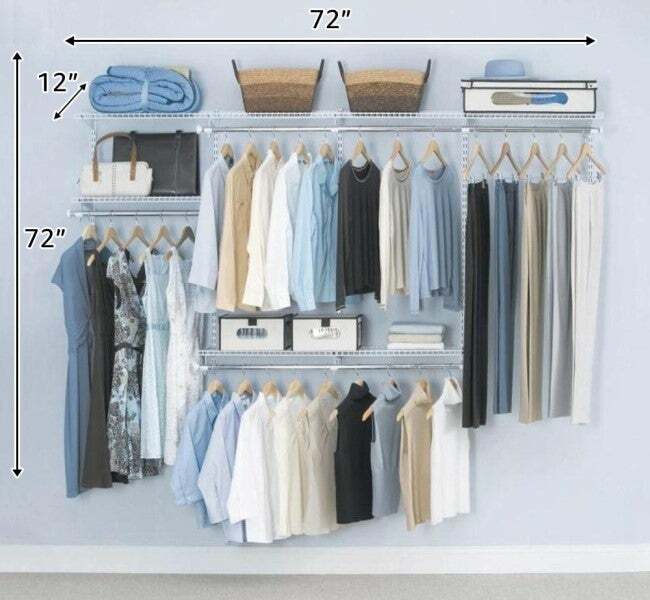 Factor in the following to find a closet system that meets your needs. Closet systems are sold in a range of materials, most commonly laminates (such as melamine), wood (solid or engineered, like particle board), metal (usually a metal frame with wire storage units), or a combination of materials. Laminate systems are usually the least expensive options ($50 to $400), but they’re a better option for budget-minded folks who wish to organize a small, reach-in closet for lightweight garments and accessories. They tend to have a less refined look than wood and aren’t as strong as metal (low-quality laminate systems can sag under heavy weight). Metal systems, which run $60 to $1,000, suit most people with small to large reach-in or walk-in closets and heavy clothing and accessories, as they can withstand a good amount of weight without warping (stainless steel systems are particularly sturdy). Metal systems are also more customizable than laminate closet systems. Wood closet systems are prone to expanding or contracting and slightly warping as the humidity level in the closet changes. That said, they can withstand heavier loads than laminate systems without sagging (albeit not to the extent of steel systems) and their hand-crafted, luxurious aesthetic can be well worth their high price point ($125 to $1,000) if you plan to live in your current home for several years or you have a large walk-in closet that gets a lot of visibility. All closet systems need to be mounted. The components of wall-mounted models are attached to the closet wall, while freestanding units are assembled on the closet floor. Wall-mounted models are ideal for closets with minimal floor space. They require drilling and mounting horizontal or vertical rails into the wall, but their assembly is, on the whole, easier than that of freestanding units because the remaining closet components can easily be snapped or hooked into place on the rails. Freestanding systems that are detached from the wall (although some models do have a hanging rod that mounts to the wall) usually have a more involved assembly that includes putting together multiple components with nails or screws. But they’re a great option for renters and others who want to avoid drilling holes in the wall. Modern closet kits come with open or closed storage units. Open storage, such as shelves or cubbies that put items on display, add visual interest to a walk-in closet and make it easier and quicker to identify and retrieve items. Closed storage, which includes cabinets for long pieces like dresses and/or drawers or baskets for small items like socks, conceal their contents for privacy but may make them more prone to wrinkling. You might want to choose closed storage in a reach-in closet you share with others where you want some privacy, or if you tend to be messy and would rather not have your disarray on display. Closet systems with hanging rods come in single-tier or multi-tier varieties. Single-tier systems may have one long hanging rod that largely spans the width of the upper closet, or multiple shorter rods mounted at the same vertical height but interrupted horizontally by a storage unit, such as a shelf or cubby. 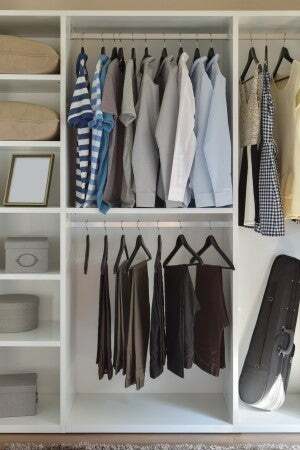 Single tier makes sense for closets that only house long items, such as outerwear, formal wear, coats, dresses, or pants. Multi-tier rod systems aren’t ideal if you have a lot of long items; they feature a minimum of one rod at the top and another rod toward the bottom, yet may include additional rods between the upper and lower rods. They’re popular with people who have small closets because they’re so space efficient, they can double or triple the storage space. The following storage options offer the best of the features outlined above and come backed with excellent reviews from experts and customers alike. If you’re planning to reorganize your wardrobe, save yourself some time researching by starting with our roundup of the best closet systems on the market. Compatible with reach-in and walk-in closets as narrow as three feet or as wide as six feet, this wall-mounted epoxy-coated metal closet system is rated 4.7 out of five stars by Home Depot customers. It can be adapted to fit virtually any closet in any room you want to organize and installation is as simple as mounting horizontal and vertical rails to the wall with screws and then snapping the hanging rods and storage units onto the rails. Between its three staggered hanging rods and six tiers of wire shelving, you’ll gain 18 feet of surface storage space and 12 feet of hanging space for outerwear, everyday attire, accessories, and shoes. Adjust the height of the shelves or buy and install an additional Rubbermaid-compatible hanging rod, shoe rack, or drawers to increase the storage potential. Available at The Home Depot. 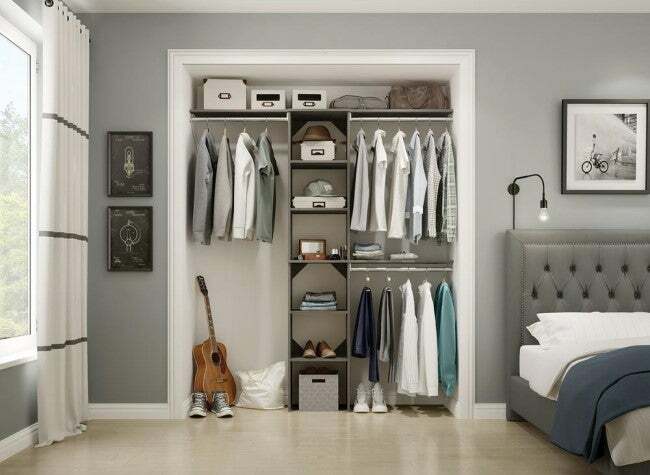 This freestanding closet system lets you bring order to your wardrobe without putting drill holes in the drywall. Rated four out of five stars by Home Depot Customers, the scratch-, stain-, and impact-resistant teak-lookalike engineered wood tower (with three hanging rods and six shelves) adds eight extra feet of shelving space to your closet while lending it a back-to-nature beauty. Assembly boils down to stacking the side panels and shelves into a tower using cam locks and then mounting the hanging rods to the closet sidewalls with screws. Trick out your closet further with an add-on ClosetMaid tie and belt rack or shoe shelves. Available at The Home Depot. Named the best “investment closet system” by The Wirecutter, the Elfa is a modular miracle available in multiple sizes and a highly customizable configuration. A popular setup for this mixed-material wall-mounted steel organizer with two solid wood shelves and two rods divides a six-foot-wide reach-in closet into two halves. One houses tops and the other fits bottoms, a set of slide-out mesh accessory drawers, and a wire shoe rack—all of which are included in this five-star-rated kit from The Container Store. You can even design a custom closet blueprint and modify shelf color or drawer material to suit your tastes, then put on the finishing touch with an Elfa Utility Closet Door Rack (sold separately). A plus for those wary of complex installations: Elfa hanging rods and storage units effortlessly lock into place on the wall-mounted horizontal and vertical rails of the system. Available exclusively at The Container Store.